One day at the Sa-Tien Center, Master unexpectedly came down from Her abode to the first tier of the center to chat with the resident initiates. Master said, "When I came to visit Hong Kong last spring, I saw the hill at this Center covered with golden oranges, too many for you to eat. Since you didn't know what to do, many oranges fell to the ground and were wasted." Master said, "Actually, we can save the extra oranges and make marmalade out of them, like Westerners do. 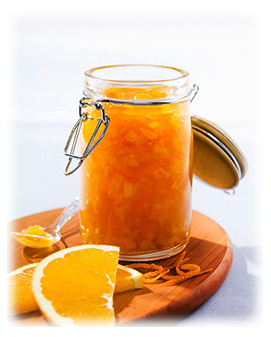 We can also make concentrated orange juice or make jams, adding different flavours in turn, and give everyone a treat. This way we won't waste what God gives us, and we can enjoy the good taste of oranges all year round." Master also reminded us, "God gives us many oranges, so that we can enjoy their good taste often. If we don't treasure what God gives us, He may take back His blessings someday. Just like the famine victims in Africa today, they used to be very rich in their previous lives. Because they didn't appreciate God's blessings, they have to receive their "Balance" in this life. They become Very poor, having no belongings. Therefore, if we are lacking something in our lives, do not complain that God is unfair; perhaps it's because we didn't treasure what He gave us in our previous lives."